This week at CD Sunday the challenge is ...Forever in blue jeans. This is my DT card, i have made a 7" x 5" tent fold . i have compiled this card in Craft artist as i find it so much easier to re-size, cut out and add shadow and do a multitude of other things within this program. 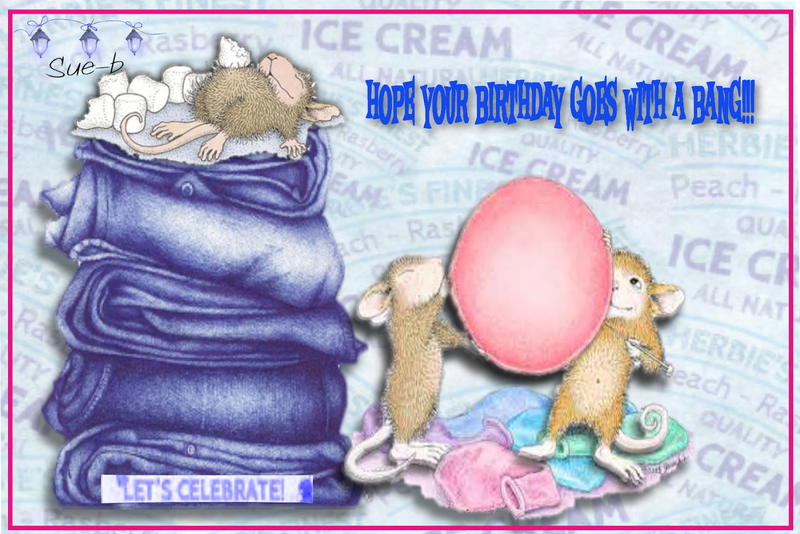 I have used a Joanna Sheen CD one of my favorites House Mouse. I just love these little characters they are so full of fun. You all seemed to love last weeks challenge and again we have had beautiful entries, your all very talented and give me plenty of ideas to use. We still have our lovely Guest Designer Sue who made a very beautiful card last week, and this week the design team have done it again with very varied cards for this weeks challenge , so plenty of inspiration to get you going. As usual just a reminder, please use something from a Cd and tell us what you have used and we look forward to seeing what you can come up with. Ooh. Thought I'd come to the wrong place. You've had a makeover. Great CAP work. Love your take on the challenge. Wouldn't want these little critters in my jeans while I was wearing them though. Tried keeping one in my blazer pocket to take to school (long time ago) and it chewed through the pocket for me. This is gorgeous Sue, I do love the house mouse images, I like the little fella on top of the pile of jeans lol.